Jonathan is over at A Life Overseas today, sharing his perspective on what creates effective communication back to senders and supporters. Newsletters. Prayer updates. Itinerations. Reports. Furloughs. Presentations. For most of us, living and serving abroad means communicating back to senders. A lot. But this isn’t what we went to school for, and besides that, communicating in person or in print is scary. It’s exposing. It’s like learning a new culture and language; sometimes when we mess up it’s funny, sometimes not so much. Communicate too much and we’ll annoy people or people will say we’re not protecting the privacy of the nationals. Talk about the right stuff in the right way. One missionary recently told me that you have to appear miserable enough that people will still support you while not appearing so miserable they want you to come home. 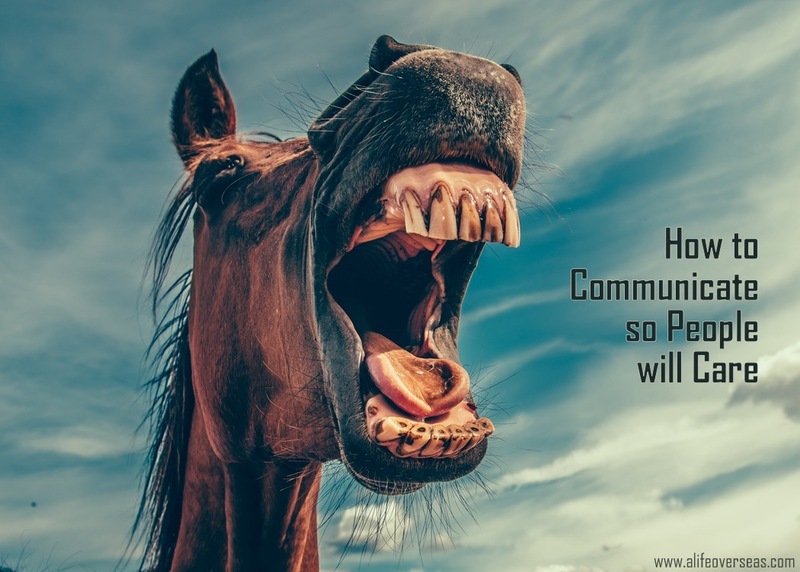 To be sure, communicating with senders (via newsletter or a live missions report) is a unique form of communication, blending a bit of travelogue with a side of sales pitch, and then adding a large spoonful of sermon. It’s like a Christmas Letter got married to a Church Bulletin and had an Amway. Will add one more to your list. When God changes your location from the over seas ministry to a stateside one with your health. It matters not what brought you home after years of being over seas, for us it was my husband health. Yet our mission and more importantly our God still thought we could be valuable with the years of experience helping those coming home on furlough. Our update were more exciting when sent from an over seas location with pictures of the people living in villages near us or the horrendous roads we had to travel. Since we do meet with many who serve in countries where it is dangerous we cannot post anything about our meetings with them. Then, because some of our meetings are sensitive to those we meet with and in the spirit of keeping our conversations safe we don’t post about them either. Sometimes I believe what we do now takes more trust then being over seas. The lesson has not changed, trust is the issue, trust we will meet the missionaries needs that we meet with. Trust for finances to do our ministry that is all about the missionaries and not us. Trust for wisdom and insight as we listen and just plain member care our members. So what to write about in those updates…a challenge every time we put words down to be sent to supporters. All the time trusting they get enough of the picture of what we do to continue to support us. Let me say this, we can still buy gas for the car, food to fill our bodies, shoes for our feet and pay our bills. Could we use more support, of course, we would see more face to face with more finances. Yet in all this I have to believe if my God owns the cattle on the hills He allots us exactly what we need so all that to say, both my husband and I are content. opps, sorry, commented on the wrong page…and I might add…trust that we can still make those who have stood with us through serving in two different countries feel they are still part of our team even if all they can give us is a prayer. This was a great post…I am going to pass it on to a couple of missionaries we met with recently where they talked to us about this very thing. As part of my ministry has shifted to pastoral care/counseling, I’ve bumped up against that same issue: every thing you’d like to share is confidential so shouldn’t be shared. But you still want to let people know what’s going on! Agh! : ) And yeah, even if you really believe the impact is huge, it might not necessarily look that way to folks who are used to seeing “village” pictures. I appreciate your thoughts here, reflecting the struggle and the ongoing need for faith. May God continue to bless you and yours as you love people and minister to the Bride of Christ! — Jonathan T.